Backyard meat rabbits are nothing new. During both world wars the raising of backyard meat rabbits was encouraged (as were hens); as well as the Great Depression. Over the decades the rabbit became more of a pet than a common livestock but recently that has begun to change. I’ve written about raising meat rabbits in other articles and I’ll share those at the end of this one. When it comes to raising backyard meat rabbits or urban meat rabbits, I could go on and on about sustainability, historical precedence and self-sufficiency. Because, frankly, the rabbit as livestock hits all those points. But lets, for today, just get down to the nitty-gritty basics of why you need to be raising meat rabbits on your homestead (not matter your location). The exact space will depend a bit on the breed you choose. But rabbits will never require acres of land like cattle or even meat goats. Generally most will require a well-built enclosure. I like to offer my rabbits enough space to hop twice and to stand. This is something that I’ve decided after a few years of raising; not all meat breeders feel like that is a necessity; but in my mind a good life is important to the quality of the meat produced. You are not going to need to build a barn or stalls to raise your meat rabbits. *I recommend a tile in the cage so your rabbits can get off the wire in their enclosures. *Nesting Boxes – I recommend these. I love how little waste is produced by raising rabbits as meat. One of the best things is having rabbit droppings for my garden and/or compost. It is an absolutely amazing fertilizer! Your backyard meat rabbits won’t require much from you. -You’ll need to provide them a safe area, free from predators. -Clean enclosures with room to move and raise kits. -A plan to deal with heat if you live in a warm climate (they are not very heat tolerant). -A breeding plan that allows the does to rest and recoup. Being a true backyard or urban homesteader often means doing it on the down-low. Raising most livestock would be difficult if not impossible to keep quiet and not alert your neighbors. But that isn’t so with rabbits! Rabbits virtually make no noise and if kept clean they attract very little flies. They are the perfect under-the-radar livestock. I even know of apartment dwellers raising a trio for their family. There are several heritage breeds that are still being raised for meat and show. Some of my personal favorites is the American Rabbit and the Champagne D Argent. Raising heritage breeds keeps these breeds viable and were created for the purpose of meat production. Rabbits, well the produce like rabbits. 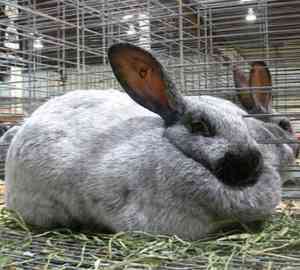 A trio of rabbits can produce upwards of 600 lbs of meat per year, depending on your breeding schedule. Your grow outs will generally take about 12 weeks from birth to butcher. Some hybrids will be ready as early as 8 weeks. The only urban livestock I know that comes close to that is quail. There are several methods to harvesting your meat rabbits. The one that has been used for years is the broomstick method and very quiet. You can use a pellet gun as well. 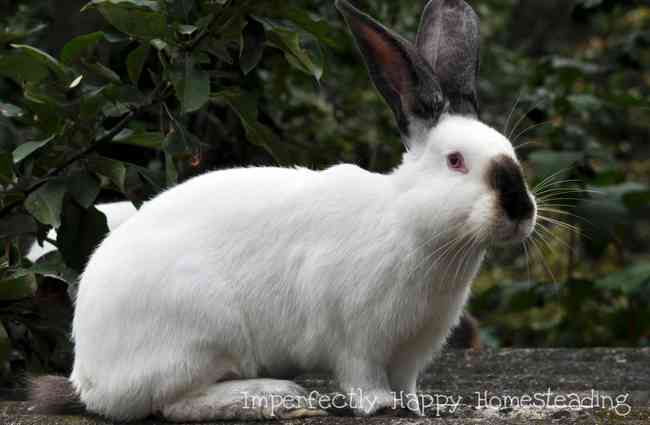 Check out The Elliot Homestead’s post on harvesting rabbits. When I’m asked what rabbit tastes like I usually respond that it is like a cross of chicken breast and a pork chop. You can cook it using just about any chicken recipe. Nutritionally rabbit meat has the highest protein of any livestock. It is low in calories and fat (I like it with bacon). It has a very mild flavor that does well in a variety of recipes and cooking styles. So there you have it, 10 great reasons to raise backyard meat rabbits. 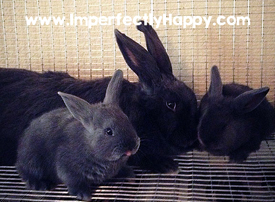 Here are a list of other articles you may want to read on raising meat rabbits. Great article. I’m pinning it so I can remember it later on. Which of these weill do well in the inland northwest? Winters can go yo -20 and summers upper 90s. Considering raising rabbits because the free range chickens are do messy. I can tell you from raising both in the summer that rabbits do much better in cold conditions (trying to keep them alive at 120 degrees is near impossible without air conditioning). With chickens it really depends on the breed; some or more cold hardy than others. They are both worth your time and space! Awesome article. I just started with a trio. Male is Californian/New Zealand and girls both New Zealand. I have them in a 10 x 10 sqf fenced area where they have a 4×8 shelter. Looks like they all have fun but someone told me that the girls could castrate the male. Is that true? Thanks for all that great info you provided us in advance. This makes me so sad! Which is ridiculous because I eat meat. How do you keep emotions out it when you’re “harvesting”? I think we all feel something. As a meat eater I want to be responsible and ethical but I know it will never be “easy”.